My daughter is a slime fanatic… ahem… slime “enthusiast” and there is always a new slime recipe or two she wants to try. We have always been fans of the glue and starch slime recipe but I have heard of the contact lens solution version and was curious to see how it worked. 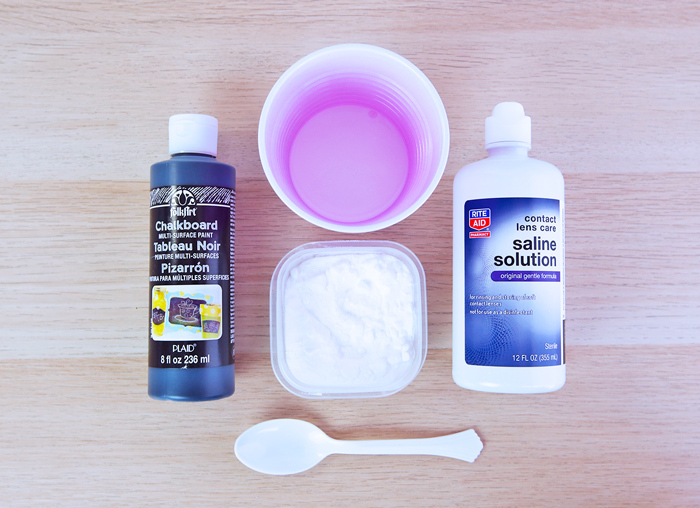 When we got a copy of Slime 101: How to Make Stretchy, Fluffy, Glittery, & Colorful Slime their chalkboard slime recipe using a saline solution was the first we wanted to try. And it was awesome! 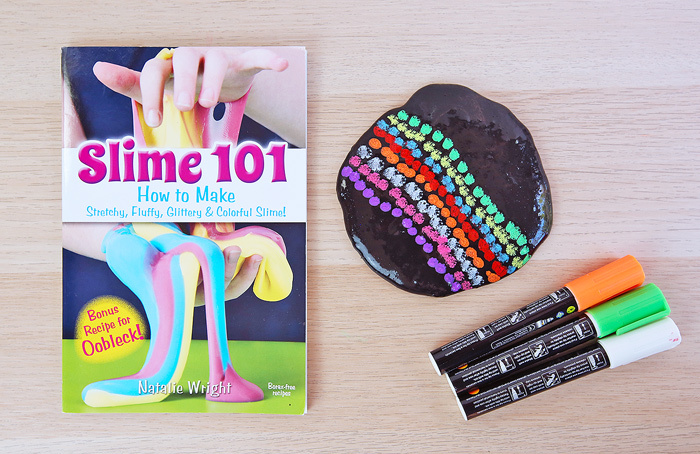 Slime 101: How to Make Stretchy, Fluffy, Glittery, & Colorful Slime is a new book by Natalie Wright published by Dover Publications. Slime 101 is a great introduction to slime making for slime novices but there are some interesting variations even for more advanced slime makers. It’s a full of pictures with step-by-step instructions on how to make 10 different variations of slime. My daughter flipped through it and was raring to try some ideas she had never seen before, like the textured and stress ball slimes. Today I’m excited to share a slime recipe from the book that you can use as a canvas for art: Chalkboard Slime. Think of this as the perfect STEAM slime! Step One Pour 4 oz of glue into a mixing bowl. Step Two Add 2 Tablespoons of chalkboard paint to the glue and mix thoroughly. Step Five If the slime is still sticky, add in a few drops of contact lens solution at a time and stir until the slime begins to pull away form the sides of the bowl. Step Six Take the slime out of the bowl and knead it for a minute or two to fully combine all ingredients. Step One Draw on it! 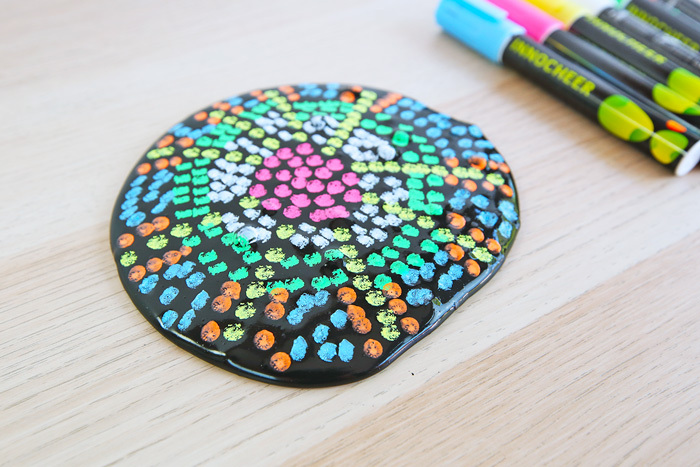 Using chalkboard markers, you can draw on the slime by pressing down to make dots. Step Two When you are done with your design distort it! Pull the slime and watch your drawing elongate. Step Three To make a new drawing simply knead the slime until the color disappears and start again. DO NOT add too much contact lens solution! We did and your slime will turn into a rubber like substance. On second thought that also is a good science experiment, ha! Store your slime in an airtight baggie. Note that this slime will be more rubbery as it sits over time. Don’t draw on the slime like you would on paper. The marker tip will get stuck in the slime. Mark the slime using dots instead. 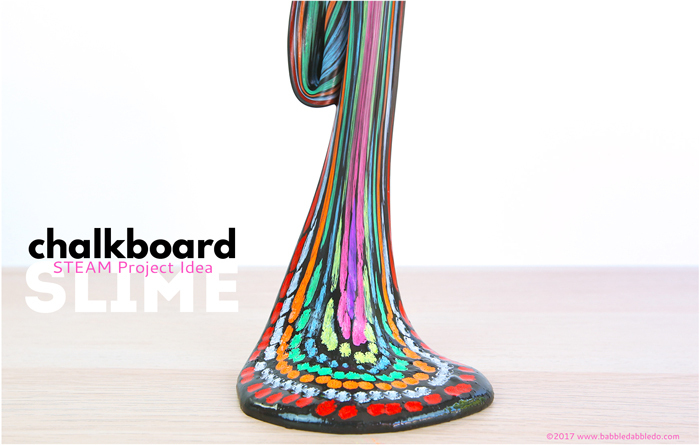 There is so much STEAM in this simple slime project I could go on and on. But let’s start with the top ideas you can point out to your child in this project. The Science: Making slime is a classic chemistry experiment where kids mix different ingredients to form a very stretchy polymer. A polymer is a substance made up of a long chain of molecules that repeat. Glue is a polymer and when you add in contact lens solution, which contains boric acid, the glue molecules and borate ions cross-link, forming a viscous, thicker polymer than before. The Art: This is the perfect intro to pointillism! Pointillism is an art technique developed in the late 1800s by Georges Seurat and Paul Signac that involves painting with very fine dots of color in lieu of brushstrokes. When you stand back from a pointillist painting, your brain combines the dots your eye is seeing into a fluid picture. If you stand up close you can view the individual dots. It’s a marvelous optical trick. One of my favorite pointillist style artists is Chuck Close. He not only plays with how your eye perceives fine dots from a distance, he plays with the average color your eye sees when a dot contains several different hues. Lastly let’s talk distortion! 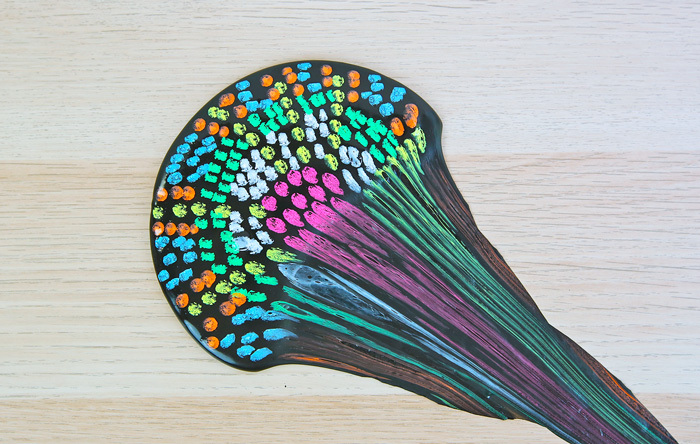 Pulling your pointillist slime drawing apart causes the image to stretch and the dots turn into strips of color. Distortion is used both in art and the design world. Sometimes an artist will purposefully use distortion to create an illusion of 3D space on a 2D surface. Distortion is also a subject well known to photographers whose lenses can cause distortion which may or may not be desired in the photo they are composing. It’s a factor they take into account every time they chose a focal length. What I was drawn to most about this slime recipe was the opportunity to work in a little STEAM twist to slime making. And seriously who can resist drawing on slime? It’s such a novel way to create art! I totally want to try this chalk slime recipe, so creative! I absolutely want to try this, I am a bit afraid of all the mess slime could entail, but this looks like worth the risk! Oh my gosh my slime-mad boy and I would DEFS try the glow in the dark slime first … which he would probably sneak into bed with … which I’d probably have to get out of his sheets the next morning, and his hair, his mattress ….🙄. On second thought …! I’d love to try the chalkboard slime! I’m a teacher and love hands on activities , they seem to bring out the children’s best colours. This looks awesome! We have tried all kinds of slime, looks like we need to try another! It’s where you blow bubbles in slime. We’ve done it before and it’s incredible! The chalkboard slime looks like awesome fun! I can’t wait to try this one with my own kids and our students! My slime mad daughter would love to try the glow in the dark slime. Your chalkboard slime is intriguing I think I’d happily sit and play with it as well as my kids. I think we would love to try the bubble slime, it sounds different to what you expect with slime. I want to make the stress ball or chalkboard slime. Both, actually all, look like fun. Hard to make up my mind! I would make the stress ball slime first. I’d try the metallic slime or stress ball slime!! Both sound like they would be awesome! My Grandkids and I are always looking for fun projects. Looks like I am a new fan. Thanks! Yay! Happy to have you!!!!! I would make the magnetic slime. I’m definitely going to do the chalkboard slime with my grandkids! I would make the magnetic slime. It looks so cool. I will for sure be making this chalkboard slime with my grandkiddles. They will love it. I will be trying the chalk board slime first!! Awesome activity and love the attention it would involve for children who want to take their art work one step more and can!! I want to try the chalkboard paint slime with my 2nd graders so I can teach about pointillism! I would love to see what the bubble slime is, but this chalkboard slime is a must for my daughter! Thank you for your wonderful projects! With all of the testing in schools today the stress ball would be a fun project! Wondering if other chalks work on the slime or just the chalk markers? Wondering if other chalks work with the slime or only chalk markers? Only the markers. There need to be some fluid to make the mark. Oobleck…my daughter has been pestering me to find that recipe! The bubble slime sounds neat also! There are so many great ones I’d love to try, like glitter, sequin, metallic, textured and glow-in-the-dark. And this chalk paint one looks so fun. But we would absolutely make the stress ball one! So fun! Thanks for sharing! Wow, tough choice! It would be either the chalkboard, stress ball or maybe the oobleck. My girls would LOVE chalkboard and glitter “sparkly” slime! We’ve never tried it but I think it would be a great activity and keep them occupied. I would be excited to try the artsy chalkboard slime. 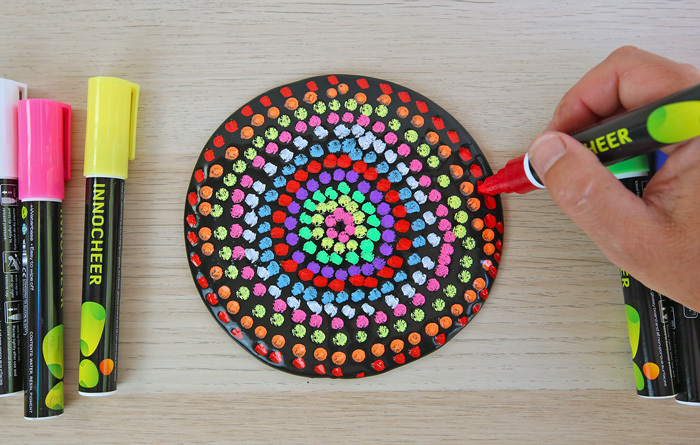 it would be perfect for celebrating International Dot Day (Sept.15) with my students. OMG international Dot Day! It would be PERFECT! I would try the Bubble Slime because I’ve never heard of it before and I like trying new things with my daycare kids. One glitter, one neon blue. The grandchildren and I would love to try these recipes. Today we tried the chalkboard slime! The boys loved it! (I did have to add a lot more saline than in the recipe, though.) Winner in our book! So glad I saw the pin for it yesterday, we needed a fun science activity today! Yay! Yes I always need to fine tune slime. I find that the temperature and humidity of where you are located affects the slime ingredient proportions. So glad you guys enjoyed it! I’d do the Sequin Slime! I don’t love to make the chalkboard slime with my students, as it looks awesome and they can practice writing letters or do maths or artworks. The activities are endless. It looks awesome with bright colours too. I just have to try the sequin slime! I have a lot of girls in my 5th grade class this year. They will just love it. 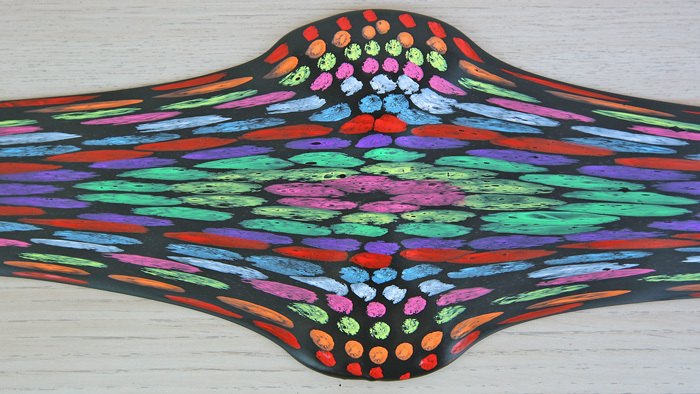 But the Chalkboard Slime intrigues me – Art and Science together. Definitely a STEM project. my kids have not been interested in the slime phenomena until they saw the chalkboard slime. Even I want to give this one a try! Omg the magnetic slime looks fantastic! Endless possibilities for our weekly STEAM study on magnetism. wow! I would try the bubble slime or the textured slime. Not sure – I’d have to see what the end product is supposed to be. After I try the chalk board slime I would like to work with the fluffy slime. I am VERY curious about the metallic slime! My 4-year-old loves slime and would no doubt insist we try every recipe! 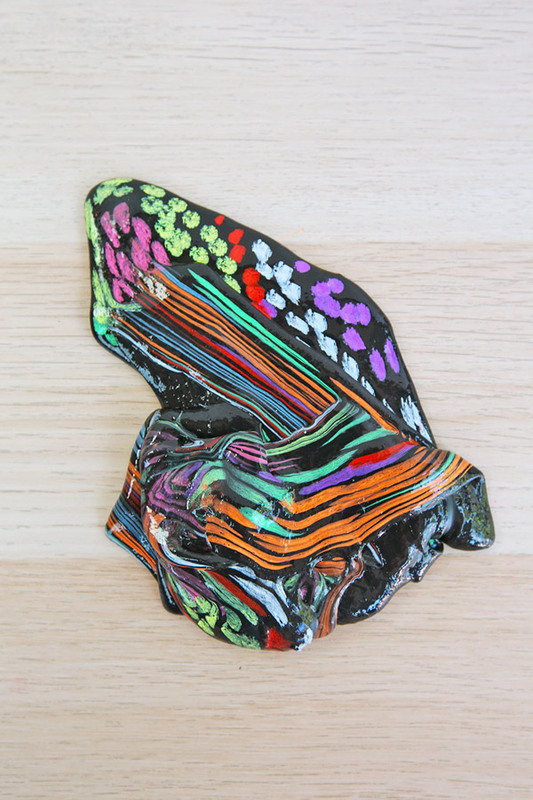 I also really like your connections between the Chalkboard Slime and STEAM – as an elementary school librarian, this would be such a cool project to bring art and science together (and then send kids back to their regular teacher with SLIME :p)! We would try the sress ball slime first! But the chalkboard slime looks awesome too!!! Would love to try the chalkboard slime – in fact I think I will since you kindly provided the recipe. The glow in the dark looks interesting too. Love your projects. My Grandson would like to try them all as he loves anything slimy. I would try the glow in the dark one so He can say I made that. My daughter LOVES it too! I would try the bubble slime. I’m curious to see how it would float! I was not able to leave a comment, in the correct spot, about the slime. I am retired but work in our school’s latchkey program. We will be incorporating STEAM into our program this year & would love to try the chalkboard slime first!! Hope I can be entered in the drawing for this book!! Oops “glow – in – the – dark” … drat autocorrect! Chalkboard slime for sure! I work with preschool students with autism and hands on Activities are the best for them! I would love to try the chalkboard and the bubble slime! I’d love to try the glow in the dark slime! I’m sure my kids would LOVE it! Okay, me too. Lol. I would try the glow in the dark slime with the kids but maybe the stress ball slime for me! 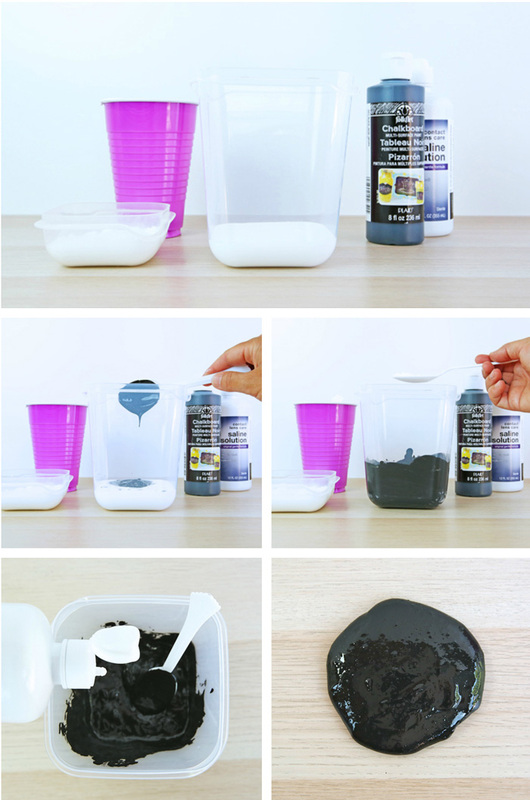 I have to try the chalkboard slime — and will be sharing the idea with my daughter’s teacher. I would try the Chalkboard slime first and then the bubble slime ,thank you for sharing . The chalkboard slime looks awesome. I’d love to try it. All of the variations of slime sound amazing. My students love making and comparing different slime recipes. I’ve never seen one on which they could actually paint, so I would definitely try the chalkboard slime first! Which recipe is your student’s fave? so this slime really appeals to me. My 3 year old grandson and I make slime and he loves it. My daughter struggles with anxiety and loves this type of stuff. I think the stress ball slime recipe sounds awesome! My daughter has anxiety issues too. Slime making has been a great calm down activity. My grandkids would love all of them but they probably would first like to try the chalkboard slime. I might like the stress ball slime. Love it! I’m buying the ingredients for my son’s birthday. We will have fun making it. The chalk slime will be making an appearance in my science classroom this year! It would totally be chalkboard slime!!!!! The chalkboard slime looks amazing, but I think my kids would be fascinated with any kind of slime we would make! I’d love to try the glow in the dark slime! How fun would that be?! I would make the glow in the dark slime first. That chalkboard slime looks amazing to me! Chalkboard slime is up first on our list. Then we would like to try the bouncy ball slime and sequins slime. We make a variation with beads but the beads always fall out. My daughter & I want to make the neon slime & stress ball slime!! Thank you so much for sharing – I work for a Boys & Girls Club and follow your experiments and projects. We have all the ingredients and are ready to try out the chalkboard slime next week. I’d love to try the chalkboard slime–my kids would love to draw on it! So want this book for my kids! Fun activity for kids to get them off electronic. I would like to make the bubble slime…it combines two things my girls and their friends love. We make slime often and love new recipes. I’m also teaching/leading a pre-school STEAM class for 4 and 5 year olds at school this year. Awesome!!! Love hearing that you are teaching a preschool STEAM class!!!! Wow, there’s so much choice! It’s hard to choose – I think I would have to close my eyes, flick through the pages and just stop at a random page!! Sequin slime looks SO cool! That’s the one I’d try first! We would doubtlessly try the glitter slime first (though that project would be quickly followed by others from the book). We tried once on our own to create glitter slime and failed miserably. oh no! What happened? Glitter slime is best with clear glue. There are so many I would like to try, but the neon and the bubble slime would be a huge hit in my 2nd grade classroom. Thanks for the chance to win this book, it looks great! Chalkboard Slime for Dot Day dots!!! I would definitely try the stress ball Slime. My daughter and I are slime enthusiasts! Sequin Slime!! Love the Bling!! Thank you for all of your great ideas. I have used many of them at the public library where I do crafts for kids all year. My daughter & stepdaughter loves slime. I’m hoping to be more open minded about the slime epimemic. I also want to be more creative with the girls when making slime. I would try the chalkboard slime first. It looks really creative. Kids love slime and these recipes just add another dimension to their fun. Thank you for perfecting the recipes and sharing them. So many cool choices! I’d like to make them all! First, I guess, Glow in the Dark! How cool is that!? My grand kiddos & my students would love ALL of these! The bubble slime looks fun! I work with many students who have some type of stress disorder, so the Stress Ball Slime is definitely the first one I would try. Appreciate you! The fluffy slime sounds so interesting! I can’t wait to try the chalkboard slime! My granddaughters love slime! Initially, I found a recipe online that didn’t work. Then I found one of yours and we haven’t looked back! Thank you! My granddaughters love slime. Initially, we found a recipe online. It didn’t work. Then we found yours and haven’t looked back! Thank you! 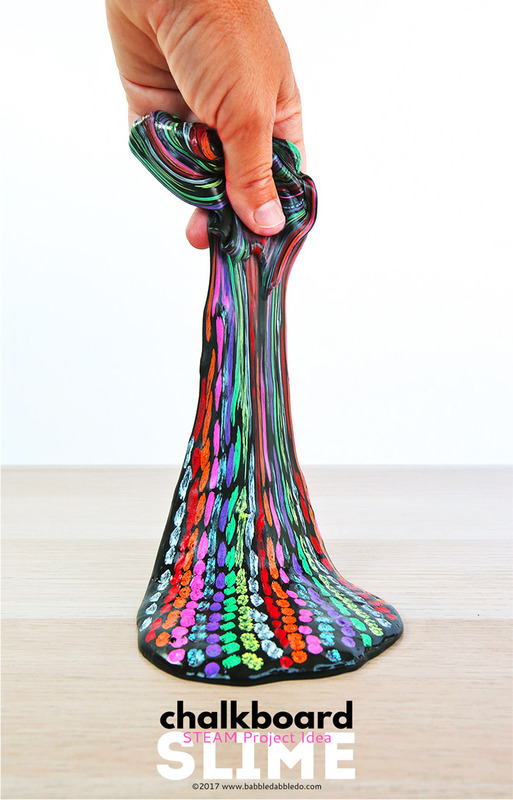 This slime looks like so much fun. I will make it soon as an after school project. I have kids come to stay until their parent is out of work. It will be perfect to keep them busy. Thank you for sharing. This will be a perfect after school project to do with the kids that come to wait for their parent to get out of work. Thank you. Being a Dr. Seuss fan, I’d have to try the Oobleck – just because it sounds like a Dr. Seuss word! We are just now this year a STEAM school and I would try the chalkboard slime with my students and share this gem with all my teacher friends! Either the bubble slime or metallic slime. Maybe we could figure out how to combine the two! For sure, I would try the Chalkboard slime in my Preschool classroom… followed up with Oobleck!!! For sure I would make the Chalkboard slime in my Preschool classroom first, but then I would have to make Oobleck! I’d love to try the bubble slime with my older daycare kids! I would like to try them all! but the stress ball would be the first 🙂 thanks a lot! They are all so awesome! So hard to choose! But, if I had to choose, I think the stress one would be great for me, as well as the kids! It all sounds like fun and interesting. The chalkboard slime would be my first choice though. The textured slime would be my first slime to try with my preK classroom. My husband teaches 6th grade science and he would start with the bouncy balls. The books interest us because they use common items we can afford as we provide all supplies needed in our classrooms. I would be interested in trying the stress ball slime for my daughter. My daughter would like to try the recipe of slime with chalkboard, it seems wonderful! I would try the glow in the dark slime first. The kids would love it!